The Kailua Neighborhood Board will take up a committee recommendation calling for a ban on almost all commercial activity at Kailua Beach Park. Japanese visitors Daisuke, left, and Kie Aoki dragged their rented kayak up the beach yesterday. 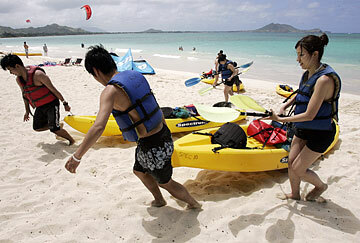 They were part of a Kailua Sailboards and Kayaks tour that had just returned from the ocean. GUIDED kayak tours, windsurfing lessons and surfing lessons are among the commercial activities that have overwhelmed Kailua Beach Park and should be stopped, some residents say. Tomorrow night, the Kailua Neighborhood Board will consider its Parks Committee recommendation that almost all commercial activity be banned at the beach park. A separate recommendation from the committee seeks to ban all kite-surfing. The neighborhood board could accept the recommendations and ask the City Council and mayor to enact the bans. Proponents of the bans say commercial ventures are crowding out residents' use of the beach and that kite surfing is a safety hazard. Opponents question why the bans were proposed without the participation of Kailua businesses that offer the rentals and lessons, or kiteboarders who count Kailua Bay as a premiere spot for their sport. Bob Twogood, owner of Twogood Kayaks and Canoes, said he was "shocked" to learn of the proposals Saturday. There have been attempts in the past to get windsurfing rental trailers out of the park, but never an attempt to ban all commercial activity, he said. The proposed commercial ban would include bounce and carnival rides, weddings, snuba, and boogie board instruction. The only commercial activities allowed would be the beach park snack bar and video shoots. 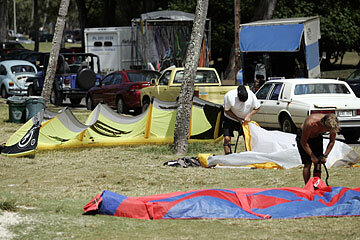 Kite surfers prepared their gear yesterday in the park. Behind them, commercial water sport rental and lesson company vans sat in the Kailua Beach Park parking lot. The bans are reasonable because "we're not saying the activity is banned, but that the commercial enterprise is being banned" from the beach, said Virginia Enos, parks committee member. "As taxpayers of this community, who pay dearly to live in this neighborhood, our beach space is being taken up by commercial activity," Enos said. Kailua residents don't want their town to be a "destination for tourists from Waikiki," which Enos said "has been increasing tremendously within the last two years." "In large kayak tours, there's a safety issue there," said Charles Prentiss, Parks Committee chairman, noting that a man on a kayak tour drown recently near the Mokulua Islets while on such a tour. Kayakers are "traipsing on bird sanctuaries at Flat Island and the Mokuluas," he added. Josh Seymour, a co-owner of Hawaiian Watersports, said customers who rent kayaks, sailboards, kiteboards and surfboards are about half local and half tourists. "I honestly think this (proposal) is from a lot of people who don't actually use the beach," Seymour said. "And for some reason they don't want to let others enjoy it." Ann Gasc, a member of the Oahu Kite Club who started kite-surfing four years ago, said she'd hate to deprive others of learning such a "nice sport, that's so much fun." "To me, it's five or six grumpy people, who want to have Kailua Beach the way it was 50 years ago. I'm sorry, but it's 2006. It's not the way it used to be."